I’m back after an especially interesting Spring Break week. There were a few days of much-needed rest at the beginning and end, but for the majority of the week I was busy with rehearsals and performances in Texas, Louisiana, and Arkansas. 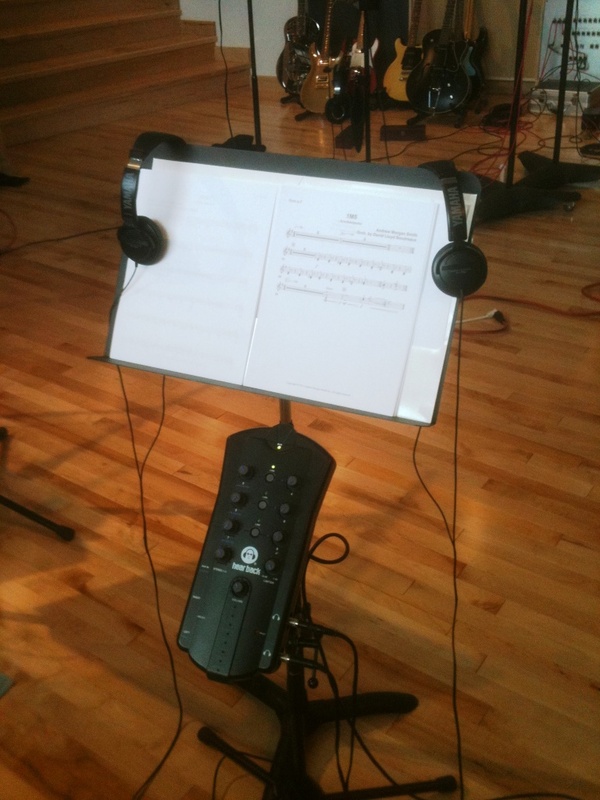 One of the highlights of the week was a film score recording session at Blade Studios in Shreveport, Louisiana. Blade Studios is a new, multimillion dollar facility which seems to be doing quite well. Louisiana offers some very nice tax incentives for the film and studio recording industries, so lots of companies are beginning to bring their projects here. Though I’ve done some recording in the past, it was always for more classically oriented projects. This was my first film score session, so I was especially interested in everything going on around me. The film is titled Arachnoquake, and is scheduled to premiere on the SyFy channel sometime in June. The music is by Andrew Morgan Smith, a young film composer based in Lafayette, Louisiana. Overall the session was a very positive experience, and I look forward to doing more studio work. Here are a few random thoughts about the session. Sight-reading, anyone? The session was scheduled from 1:30-6:30pm, and I arrived at the studio around 12:45pm. After having a little chuckle about the film’s title, I began perusing the thick stack of music on the stand. 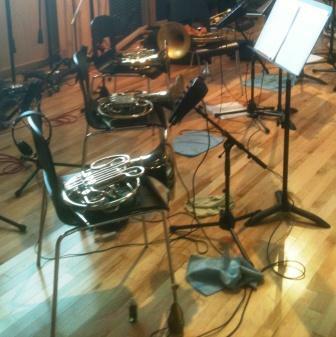 Though the score is for full orchestra, this particular session was just for the brass (2 trumpets, 4 horns, 3 trombones, 1 tuba). 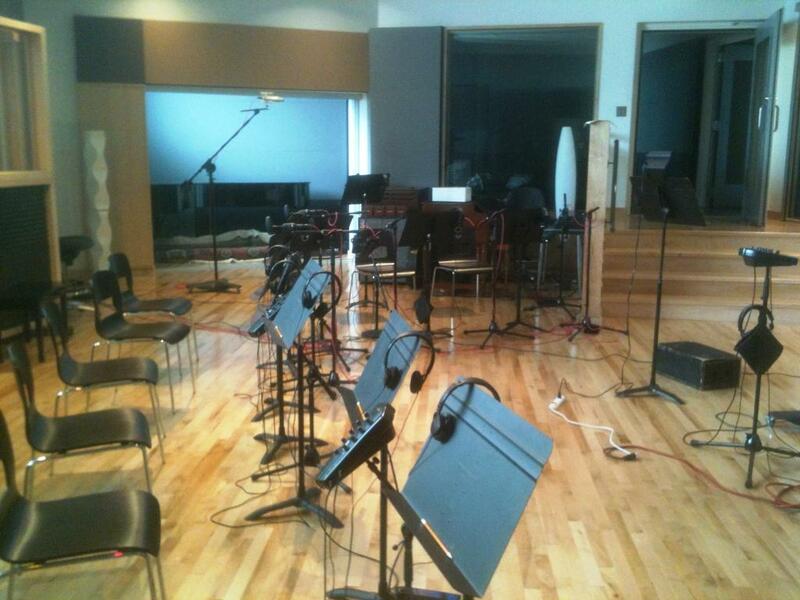 Here’s a picture of the studio, just prior to the beginning of the session. There were four horn parts, though much of it was in unison and two parts. Film scores are divided into cues, or tracks, and this film had around 30 or so, I believe. Obviously, good sight-reading skills are indispensable for this kind of work, and you have to be prepared for just about anything. I looked for unusual meters, key signatures/changes, muted/stopped horn, and anything else that appeared out of the ordinary. I didn’t end up using them, but I brought two kinds of straight mutes and a stopping mute to this session. This being a science-fiction film, there were plenty of soaring lines and big moments for the brass, along with several articulated accompaniment figures. Getting Used to the Click Track Each musician was given a pair of headphones, attached to a box like this. Each of the knobs on the box controlled a different sound level – the overall mix, the horns, or the click track. Every cue was programmed to a click track, so that it could be synchronized with specific moments in the film. I’d never played with a click track before, and it took a few minutes to get used to it. It’s of course very similar to playing with a metronome, but how often does an entire brass section with a conductor perform or rehearse together with a metronome going? Most of us played with one ear in the headphones and the other uncovered. It took a bit of experimenting with the volume to make sure we could hear the click track over the actual music, although there were a few places where it would have been painful to have the click track too loud, and we just had to go on internal rhythm for a few measures. Although the general mood of the session was very relaxed, it did get a little nerve-wracking at times waiting for the next section to be programmed into the click track. Basically there’s dead silence, and then a 4 or 8 beat click in the upcoming tempo. This was especially noticeable in difficult sections which needed to be repeated a few times to get some good takes. Generally musicians want to repeat a passage immediately if we miss something, but there were often delays while waiting for the click track be “punched in” at a certain spot. Pace Yourself, and Play Smart Everyone played well during the session, and the production staff were also very professional. However, there were a few instances when it was clear that endurance – both physical and mental – were beginning to wear down. We got a 10 minute break every hour, which was great for getting the chops and brain back in order. My advice to anyone going into a long session like this one is to be smart and pace yourself. Many of the big moments were towards the end of the session, so it was important to have some gas left to deliver even after four hours of recording. Resist the urge to go “all out” on things. It’s much better I think to back off a little and play in tune and accurately, especially if you may have to repeat a passage several times. The composer changed things on the fly in a few places, so flexibility was important as well. We finished the session at 6:30pm on the dot, and I called it a day. Some of my colleagues from the session actually had a ballet rehearsal that evening for Prokofiev’s Cinderella – ouch! Do you have any advice or suggestions about film score recording? Feel free to comment below. Studio work is so fun. I’m glad you enjoyed the session. Seems like the premiere went over well as well. I have some excerpts from the score up on my website if you want to check them out. Thanks again! Hopefully we get to track again up there. Thanks Andrew! Glad to hear the score is going over well. Will check out the excerpts on your website. Hello, I enjoyed reading your post! I am currently a grad student and am interested in doing some studio recording work for film/tv in the future. I’m thinking of moving to LA after graduation, but do you have any other suggestions of networking or finding recording areas looking for musicians? Thanks for reading. I am not an expert on this, but Los Angeles is probably your best bet for full time studio work. It may take a while to work your way into the recording scene, but it would be a good idea to set up lessons or at least play for some of the big name studio players and teachers in Southern California. There is of course studio work in other major cities, NY city, Chicago, etc., and also Nashville as well. You’d have to get in touch with freelance players in those areas to get the most current details. Good luck!